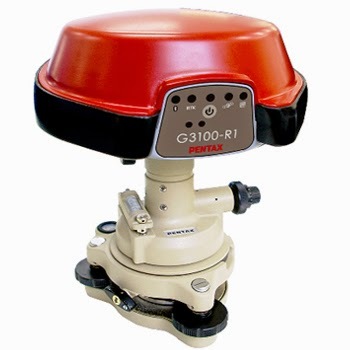 The PENTAX Positioning System G3100-R1 is a high precision satellite receiver and communication unit specifically designed for the surveying market. Integrated with state-of-the-art technology, the G3100-R1 provides surveyors high productivity, performance and flexibility. The G3100-R1 uses the AsteRx2e GNSS engine which measures both GPS and GLONASS constellatieons for robust and accurate satellite positioning. The advanced receiver technology includes Receiver Autonomous Integrity Monitoring Multipath Estimation and a standard output rate up to 25 Hz. The G3100-R1 combination of a GNSS receiver with a matched internal antenna provides an integrated product with optimal performance that is ready for use at turn-on. With the internal radio designed into each G3100-R1, any unit may be configured as a local base station to transmit corrections for RTK surveys without any change in hardware. For extended transmission range, external radios may be interfaced through a serial port. Surveyors have a choice of communication options that are all integrated into the single rugged housing. The communication options include: a GSM/GPRS modem for connecting to Real Time Reference Station networks, UHF (406-470 MHz) radio for local data transmissions, or the option to use an external radio through a serial port. The G3100-R1 houses two batteries that may be hot swapped for continuous operation. The efficient G3100-R1 provides a full day’s operation from the two internal rechargeable Li-Ion batteries (7.2V, 5000 mAh). Re-charging is done within a few hours with the included charger. All PENTAX batteries integrate fuel gauge technology to display current battery status. The unit may also be powered from an external battery for extended operation. For ultra portability and data management, the G3100-R1 logs raw data onto a removable SD card that is accessed easily through a convenient door. With the G3100-R1, getting data to the PC for post processing is simply a matter of inserting the SD card into the office PC, eliminating the need for cable download and additional software. Pentax believes in Open Architecture and the advantages that this brings to the market including the ability for users to “plug and play” and swap equipement when required, to create easy upgrade paths, and not to be “locked in” to any one supplier on the market. Due to our Architecture Philosophy, all our data interface protocols are publicly available and we are pleased to work with any suppliers to help them interface with the G3100-R1 .